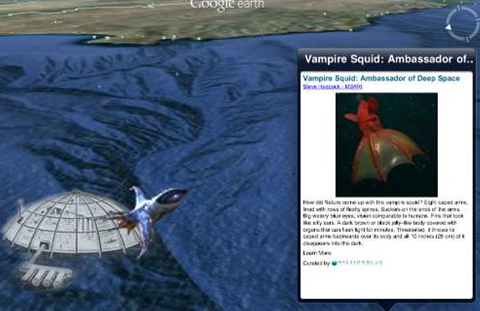 Google Earth recently introduced fantastic new features for both web and Android users called ‘Ocean Content’ and ‘Bathymetry’. The new features are getting great reviews from users as Bathymetry gives you the ability to go under the surface of the ocean and explore the world’s ocean beds. The new “Ocean” layer adds information and content on some of the most interesting landmarks of the Pacific, Atlantic, Indian and Arctic oceans. The new version has now found its way to the iOS platform and the Google Earth app for iPhone, iPad and iPod Touch has been updated to 3.1 with Retina Display support and oceanic layer content that was previously unavailable to iOS users. With this new update, you can now zoom in below the surface of the ocean and view the deep trenches and geography of the ocean floor. Dive below the ocean’s surface to explore underwater canyons, or travel to the ocean’s deepest point, the Mariana Trench. Once underwater, simply swipe the screen with two fingers to “look around.” You can always reset your view by clicking on the north arrow on the iPad, or on the compass on the iPhone and iPod. The app is free and can be used with any iDevice. Users have started reporting seeing crystal clear, jaw dropping images from under the sea with the Retina Display technology. What’s most amazing is the fact that it’s all possible to do while on the go on your mobile iOS device. The iOS platform may be a month late in getting the update than its Android counterparts but it’s worth the wait as the experience of exploring the world’s oceans just became a whole lot better with Apple’s latest Retina Display. You can download the new version of the app here.